As religious leaders who have been traveling across the country talking to region based politicians wind up their preliminary peace efforts amid fears that Ethiopia’s hope of change for the better could be consumed by ethnic based conflicts, and if it happens it could have the possibility of becoming “the war of all against all,” they held discussions at Hilton Hotel in the capital Addis Ababa today. The meeting was attended by regional state politicians but the presence of Gedu Andargachew and Debretsion Gebremichel (leaders of Amhara regional state and Tigray regional state respectively) made headlines in government affiliated media. If the two leaders said what they mean, the prospect of averting conflict between the two regions could soon be a reality. Dabretsion openly told religious leaders that that he is really sad that they are involved in the effort to make peace. “You are doing what you are doing now because we have failed as politicians,” he said. And he wants all parties to take responsibilities for the failure for he thinks “we all have erred.” Not seeing the customary habit of pointing fingers to others rather than owning failures in itself could count as a positive step. Aligning with the interest of religious leaders, Debretsion underscored the importance of peace even at a cost of postponing political issues. In fact, postponing political problems is not ideal thing to do to bring about durable peace and restore trust. It could even be an art of buying time. Yet, the tone Deretsion had as he was spekaing in today’s meeting, as seen in the video released by Fana Broadcasting, seem to represent something positive. If he can walk his talk, his conviction that issues of divergence between the two regions, most if not all created under TPLF, could be solved through dialogue kindles hope that perhaps the party he is leading (TPLF) making a seroius effort to make sense. Gedu on his part had emphasized peace in his speech. He is of the view that there is neither conflict nor an appetite for conflict between Tigray and Amhara. Noting the desire of Amhara people for peace, Gedu, like Debretsion, expressed his conviction that issues between the two regions could be resolved through dialogue. 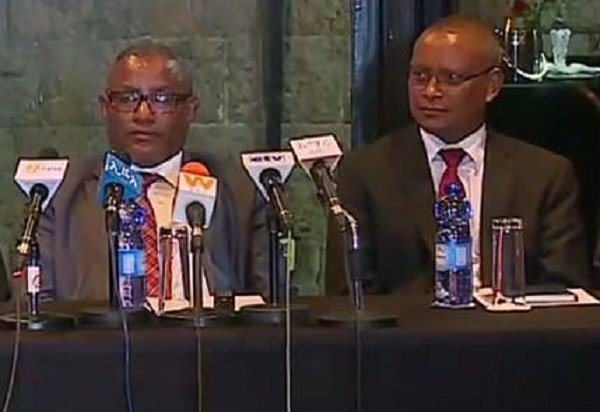 Both leaders seem to align well when it comes to the view that the people in Amahra and Tigray region are not interested in conflict and that interest in conflict is the work of politicians. It does not mean that what is happening now has nothing to do with what the parties have done in the past 28 years. In reality, the policies that TPLF followed including redrawing of administrative boundaries in a way to include some parts of what used to be part of Gonder and Wollo to Tigray region has, at least, sown seeds of conflict and mistrust. Perhaps postponing such an issue, as indicated above, may rather be a recipe for even worse forms of conflict. Ethiopia has recently established truth and reconciliation commission. And one of the tasks of the commission is to provide research based recommendation to resolve controversial issues including identity questions and claims of land. While the leaders of the two regions made unusually sensible speeches that prioritize peace, politicized Ethiopians in social media seem to be rather skeptical for they tend to see it as a public relation stunt. 2 Responses to "Flickers of hope as Amhara and Tigray leaders talk peace"
What don’t you get my friends. Wello and Gondar were not Amhara. They were kifle Hager. 50% of previous Tigray killil to become afar killil. Why do you keep repeating the same thing over and over as if if you repeat it so many times it becomes true. Some of the regions of previous Wollo and Gondar were inhabited by tigrean speakers. Gondar does not mean Amhara. Wello does not mean Amhara. The afar killil now falls smack into wello kifle hager, but you never seem to mention that. Only that tigrain took land. Be fair in yu R reporting or I will stop reading yu and you will just be one more media network who is anti tigrean. Humble Commentary, 18 Jan 2019 IT is possible to have peaceful living – if self-appointed LEADERS come to their senses and tune themselves to peaceful living. After all, “Amhara and Tigray”, as Human Creatures, were not born with hatred in their veins. It is man-made that tuned them to self-aggrandizement, greed and consequential hatred – and eventually to mutual destruction to death. Who then benefits? Eventually NONE, really.